Is there any way to change victory conditions with the game already started? Is there any way to change victory conditions of a game already in progress? There is no way to do that with the base game. You can do that by using a custom FireTuner panel, as detailed in this thread on civfanatics.com. There's a download link for the panel there, as well as information on how to add this panel to FireTuner and how to use it. how i can open/start the tuner???? Look for the line "EnableTuner = 0" and change it to be "EnableTuner = 1" then save changes. Be aware that changing victory conditions mid-game might seriously screw with the AI. Search the save file again, this time for the text \Maps. This text will occur multiple times; the final occurrence is the one we want. It should be somewhere around address 1ad0. At the end of the text, there will be 4 bytes with all zeros (00 00 00 00). The 2 bytes (4 hex characters) immediately following set the max turns: The values are stored little-endian, so you have to reverse them to convert from hex to decimal. How can I edit saved games in Civ V? How to continue beyond turn 100 in the Scramble for Africa scenario? Is there any way to see Civilization V's civilopedia without activating the game? Is there any way to 'turn off' science and convert it into something else? Is “Micro-Empire” a viable strategy for one or all of the victory conditions? 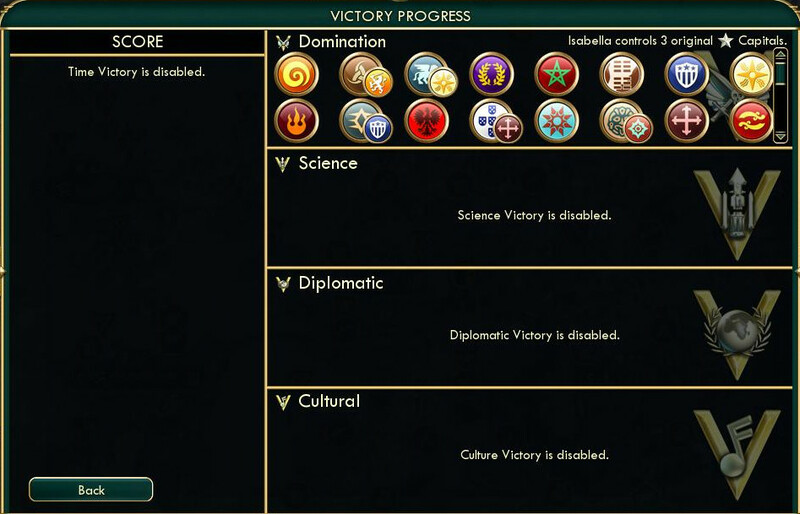 Civ 5 Diplomatic Victory possible with defeated civs? Where can I view the Victory conditions in an online match in Civ 5? Is there a way to play a game with some elements from “Empire of the Smoky Skies” scenario? Is there any way to change game pace of a game already in progress? Does game speed in Civ-V affect the viability of paths to victory? Is there a way to tell which spaceship parts the other civs have built?